The sludge carrier HOUNSLOW in the river. She was owned by Greater London Council. Built in 1968 at 2,132 grt. Photo taken from the deck of S T PORTWEY. My favourite “Bovril boat”. I say that simply because in 1973 on this vessel I made the round trip from Beckton to Black Deep on HOUNSLOW. 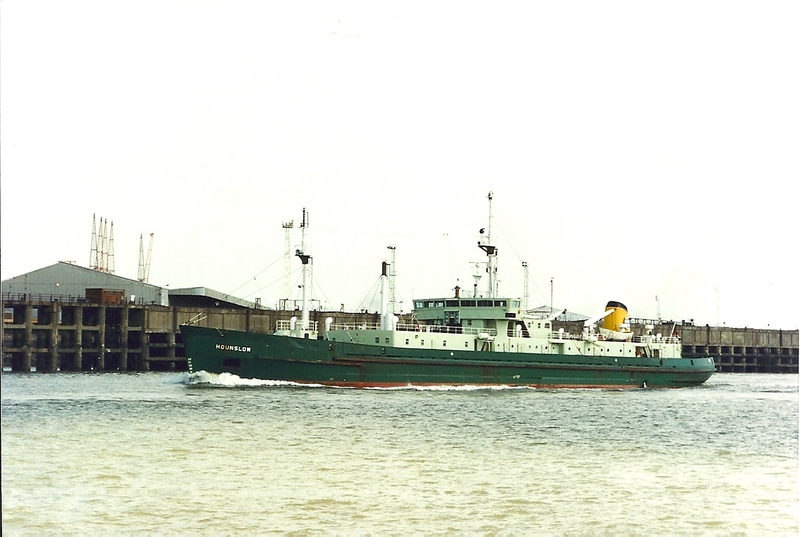 One of the last vessels to join the then sewage sludge disposal vessel fleet owned by the Greater London Council, HOUNSLOW was built in 1968 and was on 2132 tons gross. It could be said that she had a spectacularly uninteresting career, most of which was to the Thames estuary dumping grounds, which meant that she passed Tilbury twice daily. 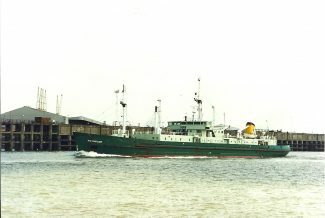 In 1974, responsibility for sewage disposal in London was taken over by Thames Water Authority, which acquired this and other ships, and in 1990 it went to its offshoot Thames Water Utilities Ltd. With new EU-wide legislation banning dumping of waste at sea, HOUNSLOW was put up for sale in 1999, and after doing not a great deal was renamed CROWN in 2006. Although its difficult to establish where, it seems that in 2010 the vessel was sold to an intermediary for eventual scrapping in North Korea.